I'm so glad my nose isn't stuffy anymore. While cats occasionally might experience an upper respiratory infection (URI), sort of a kitty cold or flu, those who don't get better within a few days or who constantly experience URIs require testing to find out what's wrong. Always consult an experienced veterinarian regarding the health and treatment of your pet. You've certainly experienced all the symptoms of a URI yourself, so you know how Kitty feels. Ask your vet about a feline equivalent for chicken soup. Your cat may be sneezing, his nose may be stuffed up or there might be a discharge. His eyes also might be affected, for instance they may be gummed up or inflamed. He's probably lost his appetite, becomes lethargic and feverish. If you look inside his mouth, you might see ulcers. Normally, a URI runs its course in a week to 10 days. If your cat suffers longer than that, or he improves and then comes down with a URI again, he's got a chronic condition. If a cat struggles with frequent URIs, the feline calici and herpesvirus are likely culprits. Many cats are exposed to these viruses. If you've ever found stray kittens with goopy eyes, that's the herpesvirus at work. The feline viral rhinotracheitis, calicivirus and panleukopenia (FVRCP ) vaccine gives cats some protection against these viruses, usually resulting in milder symptoms. Once a cat has the herpesvirus, he's a chronic carrier, even if he doesn't come down with URIs. Bordetella, chlamydia and Mycoplasma organisms also cause URI symptoms in infected cats. Infection with Bordetella results in the feline equivalent of kennel cough. Chlamydia usually starts off affecting the eyes, although it can progress to a URI. Certain types of Mycoplasma, which also can cause anemia, result in URIs. Although vaccinations for Bordetella and chlamydia exist, their effectiveness is limited and most vets won't recommend them unless your cats are at high risk of exposure, such as felines kept frequently at boarding facilities. As with viral infections, secondary bacterial infections often affect cats suffering from these URIs. Treatment of viral URIs includes antibiotics to treat secondary infections, since they don't work against viruses, as well as lysine supplementation to combat feline herpesvirus, IV fluids if Kitty is very dehydrated and special diets if your cat isn't eating. If your cat's URI is due to a bacterial infection, your vet will prescribe antibiotics. For chlamydia, a prolonged course of antibiotics, along with topical antibiotics for the eyes, usually gets rid of it. Chronic URIs are one symptom of the feline immunodeficiency virus (FIV), the equivalent of feline AIDS, or the feline leukemia virus (FeLV), the most common cause of cancer in cats. Your vet performs a blood test to detect the presence of either virus in your cat's blood. Symptoms of both overlap, including weight and appetite loss, fever, chronic diarrhea and various, recurrent infections. Your cat's body can't fight off the viruses and bacteria that a healthy cat's system easily shrugs off. 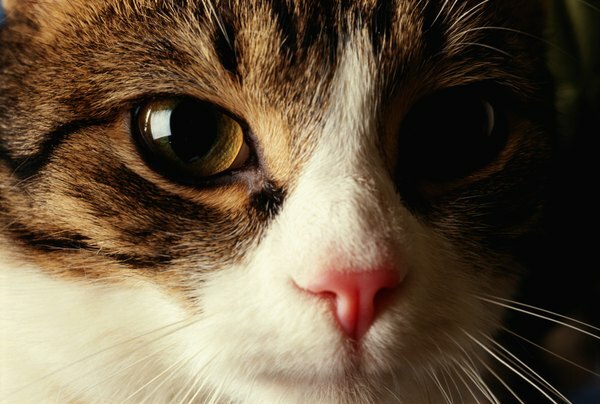 Infected cats spread these viruses through bodily fluids. While Kitty's prognosis isn't good with either infection, careful management can keep him around for a while. He must stay indoors and away from uninfected cats. Feed him high-quality food, keep his life as stress-free as possible, and take him to the vet for check-ups on a regular basis.